1 . Melt the butter in a medium-size saucepan over a medium to high heat. When melted and bubbling add the shallots and cook for 3-4 minutes, until lightly softened, but not coloured. 2 . Pour in the rice and fry with the shallots, stirring almost constantly for 1 minute. Pour in about 1/5 of the stock and gently stir as it comes to the boil. Continue to stir and add stock in small amounts until all the stock has been used up and the rice grains are cooked yet still retain a slight bite – roughly 25 minutes. 3. Take the risotto off the heat and stir in the mascarpone, chopped chives, half the chopped dill and the lemon juice. Tip the risotto out on to a tray and leave it to cool to at least room temperature. 4. Preheat the oven to 200°C, gas mark 6. When the risotto is cool, lay the salmon – skin side down – on to a flat baking tray lined with baking parchment. 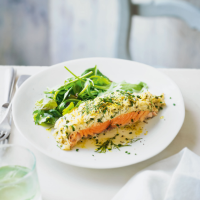 Season the fish and spread the risotto over the salmon, spreading it and building it up as neatly as you can. Try to be consistent with the thickness of the rice. 5. Place in the oven and bake for 30 minutes. Let the salmon sit for 5 minutes before dressing with the remaining chopped dill and the lemon zest and serve.